The president of the world’s largest Christian college admitted today that it was his idea to invite Mitt Romney to deliver this weekend’s commencement speech at the university, and that he plans to also invite Obama before the election. Jerry Falwell, Jr., who became president of Liberty University in Lynchburg, Virginia following his father’s death in 2007, stated that he had contacted one of Romney’s advisers to pose the idea. Interestingly, the adviser was Mark DeMoss, who is a professing evangelical Christian and president of The DeMoss Group, a marketing company that assists a number of high-profile Christian ministries nationwide. Falwell stated that DeMoss felt that the invitation was a “great idea” and recommend that he officially invite the presidential nominee. 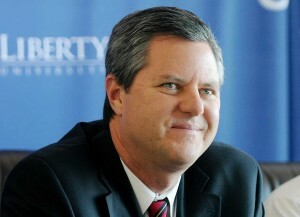 Like his father, Falwell’s decisions to invite and promote those of different religions have raised a lot of eyebrows. Last year, Falwell invited Glenn Beck, also a Mormon, to deliver the commencement speech and awarded him with an honorary Doctorate of Humanities degree. In 2007, then Republican nominee John McCain gave the commencement speech to students. Today, Falwell, Jr. admitted that since the school’s inception in 1971, the vast majority of speakers at the university’s graduation ceremonies have purposefully not been Christians. He bemoaned that he does not understand why there is so much negative reaction to his invitation to Romney, including the fact that some students have threatened to forego the graduation ceremony. Liberty students are not able to choose who speaks at their commencement ceremonies.